This post doesn't need a lot of explaining, it's simply the top 12 ranking of players, teams, and owners. I'll chime in when needed but you can scroll down to see who has been the best or worst something or other in our league's history. We'll start with checking out the top 12 QB's by PAR and points. It's pretty appropriate that Manning and Brady battle for the top PAR and points in our league being that they are the two best QB's we've seen in our league so far. 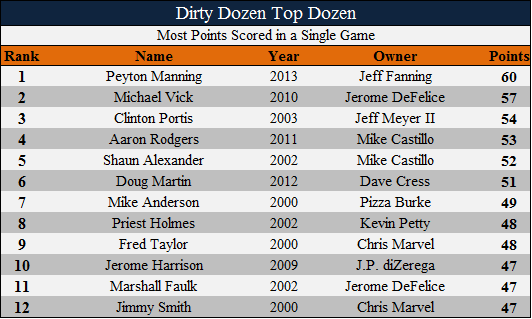 If you're wondering who has the highest PAR and most points scored in a season ever, it's Mr. Manning last year. With the direction that the NFL is going lately, this list will be updated with new names each year. Now onto the players that run with the rock. You knew before you saw this running back list that LaDainian Tomlinson would be at the top. We see a lot of players on this list that played early in our league's history, which probably doesn't shock many people being that the 25+ carry a game running back has been going extinct since around 2006.. Snap to snap, game to game, season to season, it was hard to know what you would get from Randy Moss. When Randy gave a crap, he was unstoppable, like in 2007 and 2003. This list is full of likely future hall of famers except for Josh Gordon and Mushin Muhammad. Tight Ends are up next. Tony Gonzalez never had a season where he was head and shoulders above the rest but he was quite possibly the most consistent player we've played with ever. Being on the top PAR list 4 times is evidence of that. Gates should get some love and might make his fourth appearance on the PAR list if he continues to play well in 2014. Gronk's had the best season we've ever seen and I wouldn't be surprised if we see him on this list a few more times before he retires. Let's shift to the other side of the ball. It's never been a secret to how the Ravens won football games. It's usually because of their dominant, ballhawking D. Chris has been the lucky owner to own the Ravens when they ran roughshod on the NFL in 2000 and 2006. I also think it's safe to say that we won't see many new D's on the points list based on all the offensive points that teams are scoring in the NFL today. Let's show some kickers some love. These kickers all seemed to play on high powered offenses and all sent plenty of piggy's through the uprights. If you knew that Jeff Wilkins had our best kicking season off all time, you are a scholar of D12 football. We've seen the good, now lets laugh at the bad. 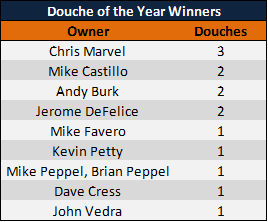 Bradlee Van Pelt is a hero to many owners in our league so it's tough to see him at the top of this list. Truth be told, Fanning probably just picked him up at the end of the season to be funny. That could be the case with most of these guys as I'm guessing they were picked up at the end of the year to fill a roster spot late in the year as a flyer or were held onto with hopes of recovering from injury or something. Let's see what players have scored the most points in a single game. 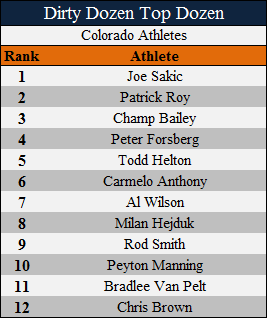 And here's another list that Peyton is at the top of. Week one of last year was a huge night for Peyton and a sign of great things to come all season long. And now we'll see which owners have scored the most points in a week. 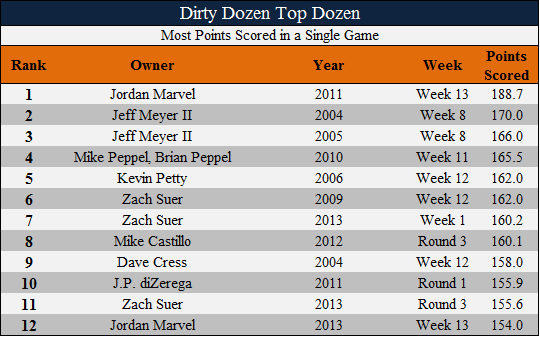 Jordan Marvel beat the piss out of the commish in 2011 and his 188.7 point week could stand for quite some time. Meyer and Suer have experienced a fair amount of super Sundays that gave the fantasycast a workout. 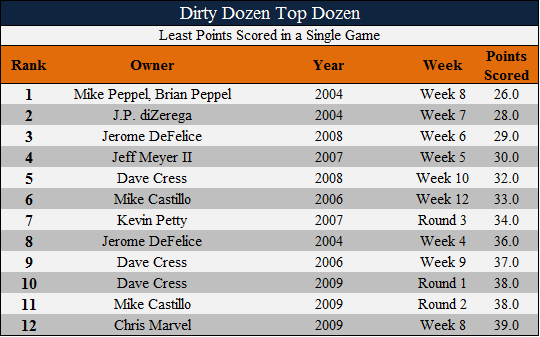 We've steadily added ways to rack up points, which is why these really low scores here were all from a long time ago. I'm still trying to wrap my head around how a team can score in the 20's no matter what year it was, though. 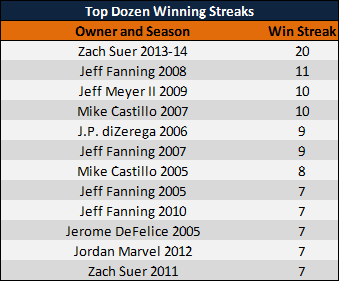 I meant to post these lists last week, which is why Zach's 21 game winning streak is misrepresented here as only 20. This record is like Joe DiMaggio's 56 game hit streak as I don't see any way this record will fall as long as we live. Dave might've guessed that he would be on this list and his tag as the lovable loser is highlighted above. 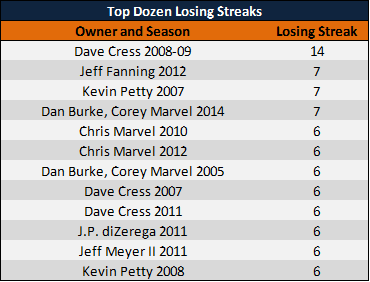 Dan and Corey should also have 8 consecutive losses on this list as they set their sights on the one record they definitely don't want. Now let's see how we all compare to each other with our all time W-L records in this league. 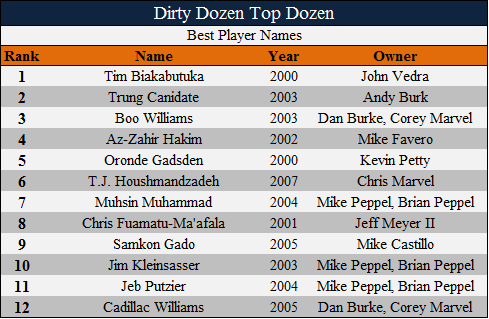 There hasn't been much movement to this list over the years but the way Zach is playing, don't be surprised if he's the top dog on here if and when this list is updated. 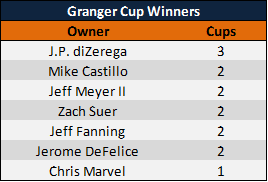 Ever wonder who has won every Granger Cup in our league and how many times? I'm actually kind of surprised that out of 14 years of playing this silly game, only seven owners have been able to experience the highest high of being crowned a champion. 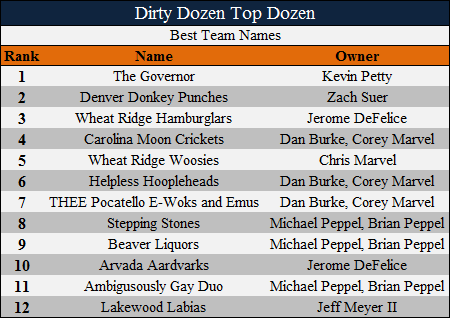 Let's see who has dominated the scoreboard the most in our league. Due to the lack of banners and recent success, you can forget that Kevin had some really good teams in the early years of this league. Get out your nozzles and let's do some douching. Chris has been embarrassed the most times by going up to the checkout counter three times with a big bag of douche in his hands. 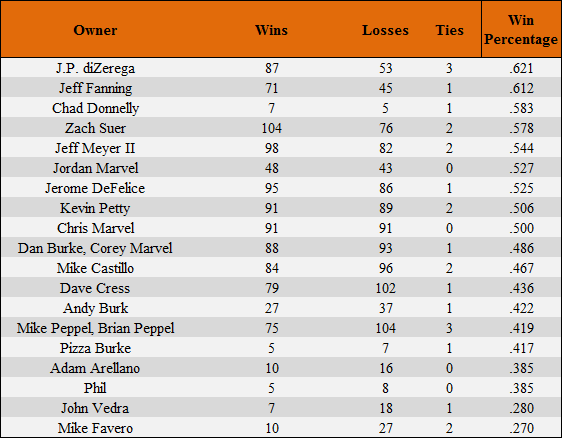 Now we can see how everyone's average rank in the regular season and postseason compares to every owner ever. 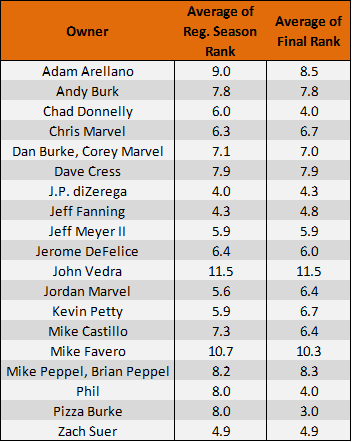 J.P., Fanning, and Suer have the lowest averages, which was predictable. Vedra and Mock were annual D12 donors. Let's see the owners that pummeled their opponents on a Sunday like Drago did Appolo. I've made mention of Jordan's massacre in 2011 and now you can see the only game we've ever seen with a 100+ point margin of victory. Jordan should've been the de facto commish after embarrassing Jerome. J.P.'s laid the wood to his opponents more often than anyone else has. No guilt in running up the score in this league. Granger danger. 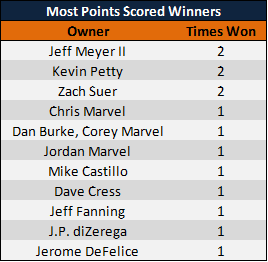 Jeff's squeaked out our lowest scoring games and also has been on the right side of a tight score more than anyone else. I wish I knew how many of these were the result of an overnight scoring adjustment. Of course there were many ties from the early years that would be the lowest margin by definition but ties are lame so I didn't include them here. Here's a dumb list made by a dumb guy who is dumb. No reasoning behind any of these picks besides they either made me laugh or have been iconic names in our league for a long time. If you don't grin at each and every name on this list, you are a jerk. Some of these might make you smile, too. 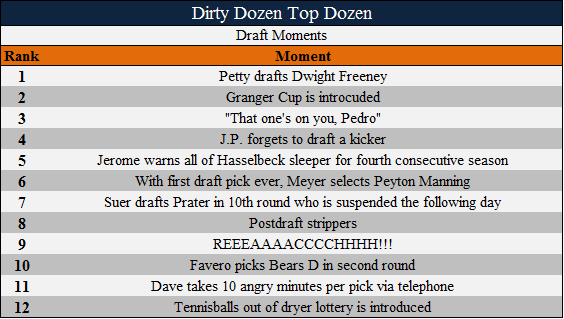 I'm sure I'm forgetting a few funny moments but that's what happens when alcohol diminishes everyone's memory by the 10th round of every draft. OK, I'm running out of ideas now. You can like hockey or not but you can't debate that the Avs have fielded the best and most enjoyable teams to watch since we started this league in 2000. That is why you will see so many memorable skaters on this list. Figured I'd give CSU and CU some love at the bottom of the list. Keep in mind that these are based off of performances from 2000-2014 before you call me a hooplehead. Below is each and every keeper we've kept and the amount of times they've gone steady with their D12 owner. And finally, let's see what NFL teams we have drawn our D12 talent from the most times. I hope you enjoyed taking yet another look back in our league's past. This is probably on your personal top dozen list of mindless time wasted in front of a computer now, too.